Handy Recovery is data recovery software designed to restore files accidentally deleted from hard disks and memory cards. Handy Recovery can recover files damaged by virus attacks, power failures and software faults or files from deleted and formatted partitions. If some program does not use Recycle Bin when deleting files, Handy Recovery can restore such files. Handy Recovery can also recover files moved to Recycle Bin after it has been emptied. With Handy Recovery you can browse the content of your disk like you do it in Windows Explorer. The only difference is that you see deleted files and folders along with the regular ones. 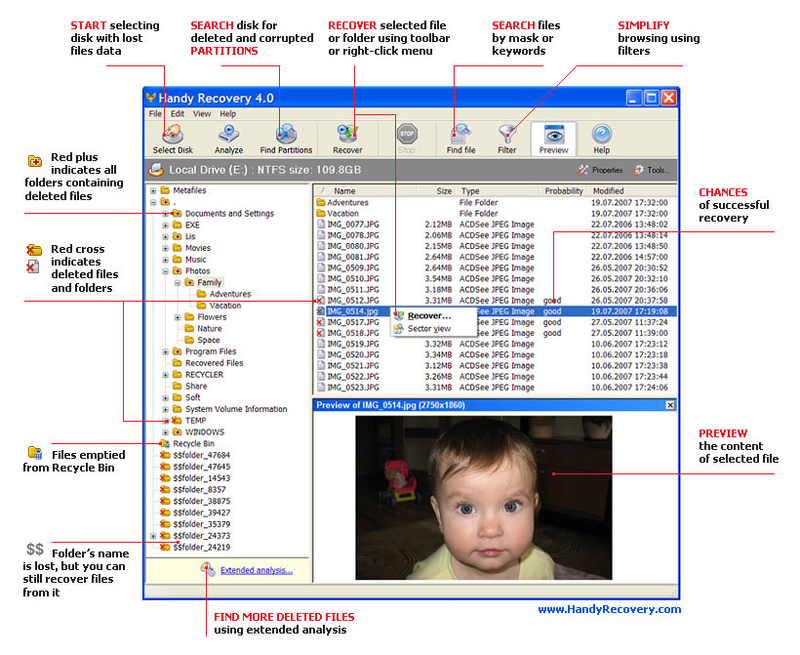 Handy Recovery can search for files by name or mask and show the probability of successful recovery for each file. Recovered files can be saved to any disks accessible on your system. You can also restore the full branch of folders tree containing selected files and folders. Along with the main file data, Handy Recovery can recover alternate data streams which are used on NTFS file system to store additional information about files. Qweas is providing links to Handy Recovery 5.5 as a courtesy, and makes no representations regarding Handy Recovery or any other applications or any information related thereto. Any questions, complaints or claims regarding this application Handy Recovery 5.5 must be directed to the appropriate software vendor. You may click the publisher link of Handy Recovery on the top of this page to get more details about the vendor.